To build a map, reach out to our team to request access. 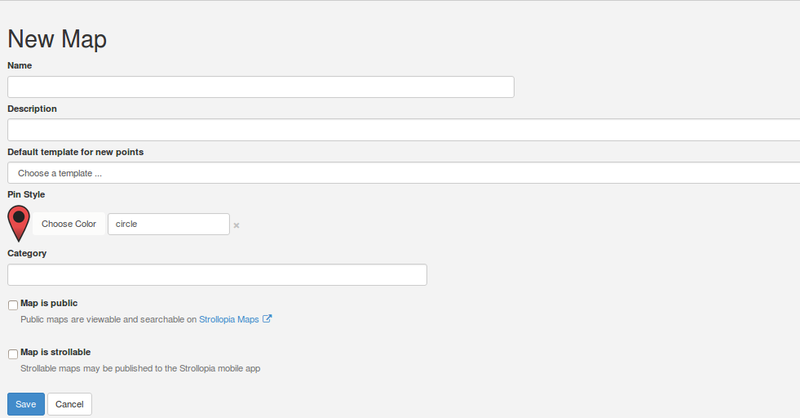 Once we set you up with an account, you can start working with the Strollopia Builder Dashboard. Use the default template for now. Choose a pin style and color for your stroll. 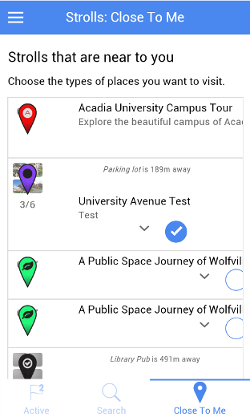 Leave the default radius of 10 metres for now – it is used for people exploring your map through a mobile app. When they have arrived at a checkpoint their phone will buzz and display the information you have added about that point. Check the box to make sure the map is public and strollable. Public means your map can be embedded in a website and strollable means it will show up on your cell phone! Done. Click Publish. Time to build your stroll. Locate your stroll area on the map and zoom in to enlarge it. Click on New Checkpoint. You can enter an address, or simply drop a (draggable) pin on the map. So for now, let's click Map Center. A pin will be dropped onto your map. Drag it to where you want it and give your checkpoint a name. Now add a picture and a brief description. Click Save. You've just created your first checkpoint! 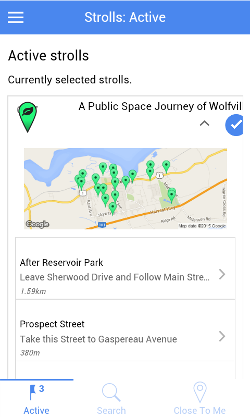 Once you've added more checkpoints, you can download the Strollopia app on your cell phone and go for a stroll. Download the Strollopia app (from Google play or iTunes) and open it on your cell phone. From the tabs at the bottom, select Search and type in the name of the stroll you just created. You should see a map and underneath it a list of the checkpoints you created. To see a content card with all the information you just entered (the name, picture and description), you have to start strolling. Once you're within 10 metres of a checkpoint, your phone will buzz and display the information. Go to your Strollopia Builder Dashboard, click on Build, click on the pin you wish to edit, click edit – this will take you to the original builder interface. Click advanced at the bottom right of the page and +New Field. This will allow you to add a new field for our mp3 file. From the drop down menu, choose Sound, upload your mp3 file, add a label and select whether you want the audio to start playing automatically when you arrive at your checkpoint. Click Save. Done.